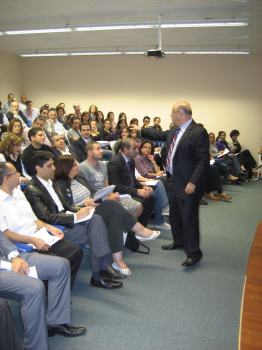 As part of its “Keep Learning” alumni lectures program, the Alumni Relations Office organized lecture #1 of the academic year 2010-2011 titled “Awaken the Leader in You” on Friday November 26, 2010 at the Business Building, Beirut Campus, room 904. The lecture was presented by Mr. Elie Samia, lecturer in Politican Science and Sociology and Executive Director of the Outreach and Civic Engagement unit at LAU. Over 220 alumni and friends attended the event which was followed by a reception.